Unforgivable is the shocking real-life story of suffering and survival from child abuse victim Collette Elliott. "I brought you into this world and I can take you out with one click of my fingers." What if Baby P or Daniel Pelka had lived to tell their tale? Collette Elliott once had a similar story. She slipped through the net and only just survived. Her childhood was a place of filth and terror. Her prostitute mother abused and neglected Collette; leaving her with clients, starving her and beating her to a pulp. But the worst thing was that the people who were supposed to protect Collette turned a blind eye. This is the story of a little girl who waited years for justice. It's the story of a woman determined to protect other children from suffering her fate. Collette Elliott is a 35-year-old mother of four. She was born in Birmingham to Maureen Batchelor, a prostitute, and suffered years of physical and mental abuse. In April 2013, Birmingham City Council awarded her £20,000 in damages for the anguish she suffered and their failure to protect her. Collette is now happily married, a devoted mother to her girls, and is campaigning on behalf of other child abuse victims. This book is a horrible account about Collette has to deal with. 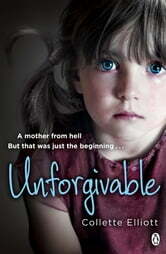 Her Mother and stepfathers physical and mental abuse towords Collette is something no child should never endure. A must read ut not for the weak at heart.